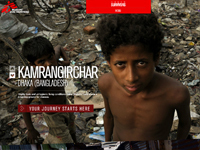 The Urban Survivors web-documentary—at www.urbansurvivors.org—takes the visitor on a virtual journey through five slums—in Dhaka, Bangladesh; Karachi, Pakistan; Johannesburg, South Africa; Port-au-Prince, Haiti; and Nairobi, Kenya—where MSF is actively running projects. 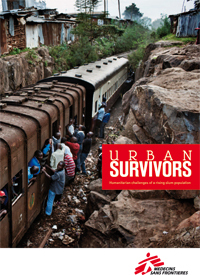 Featuring the work of award-winning NOOR photographers, Urban Survivors lets the visitor discover more about the daily lives of people in these slums, the humanitarian issues they face, and what MSF is doing to address these problems. In 2009, humanity crossed a profound threshold. For the first time, more than half of the world’s population lived in cities rather than in rural areas. Many people made the move seeking greater economic opportunity, but rapid and sustained urbanization has swelled existing slums, and spurred the creation of new ones in countries around the world. More than 800 million people now live in slum conditions. That is more than one out of every 10 people on the planet. Through its work in urban settings throughout the developing world, MSF has first-hand experience of the impact that slum environments can have on public health. Slum residents live in a state of constant vulnerability. Pervasive pollution and unhygienic living conditions breed diarrheal and respiratory diseases. Population density, the lack of proper sanitation, and the shortage of public health facilities mean that other communicable diseases—cholera, for instance—or severe weather can have devastating effects. Slum inhabitants often must adjust to a life of poverty in a place where there is more violence and more crime, where they are marginalized and discriminated against. Women, children, and undocumented migrants are particularly at risk. For most people living in these circumstances, daily life remains extremely challenging. What’s more, the total number of people living in slum conditions is growing. MSF has been responding to urban health problems in a host of different ways—treating malnourished children in Dhaka, responding to cholera outbreaks and sexual violence in Port-au-Prince, and providing medical care to vulnerable migrant populations in central Johannesburg, to name just a few examples. Given the unplanned, unregulated, and largely uninterrupted flow of people into urban centers, there is an increasingly urgent need to recognize and understand the fact that slum residents are indeed facing a medical humanitarian crisis.